It was another lovely day in the neighborhood...why? I love peeps. I do...but I really only like the yellow chicks. I know the other colors are all suppose to taste the same...but for some reason, not to me. The yellow are the best...closely followed by the new orange. ...well they are not as wonderful as their cousins, the yellow peeps...but they are pretty damn good. So, if you see them at the store, go ahead and give them a try. ...on to other things. As you can see I am going for a casual feel these days. Fact is a lot of people are on vacation at work this week, so I don't have meetings. Tomorrow is my Friday, which is nice...and I plan on enjoying a nice long weekend with family and friends. It's been such a strange "winter" for us in Miami...it's actually been cold. Just when I thought we could break out the sundresses and sandals...it cools down again! This weekend it was actually warm and nice. Here's a look at what I pulled from my closet. I've been shopping in my closet a lot lately and plan to keep doing this. I have some great oldies but goodies that deserve more time in the sun. ...and I do hope the sun decides to stay out for a while. Do any of you have any fun spring plans? Oh so happy it's Friday. Aren't you? Although I do have to do some work tomorrow, I still don't have to wake up as early as usual. As you can see I did not wear my usual Friday jeans today. I felt like being really comfortable since I had to stay late at the museum for an event. So...I went with this super long Liberty of London Maxi Dress from Target. I love this print. I know I normally don't show the actual pictures of what I wear...but I LOVE this print. I love it so much, I bought little Olivia the matching top and my friend K's little girl the matching bag. The dress itself happens to be one of the most comfy things I have recently bought. The only thing missing is pockets...guess you can't win them all. I know it's been about a week since I last posted a sketch of an ensemble. Yesterday and today I wore some oldies but goodies that I adore. The red dress is so comfortable, it has pockets and you never need to wear a necklace with it because of the tie. The multi-color dress is one of my favorites...especially when I tell people where it's from...JC Penny! I got it over 2 years ago though. Anyhow, the week is almost over and I do have a busy weekend ahead of me. So busy, I don't get to sleep in or anything! So sad. So, have a great day tomorrow and we'll see what I wear. While I was in Dallas, one of my favorite bloggers, Social Climbers tagged me with these fun questions. She is the Queen of the Preppy Mafia...so I shall answer...and then tag my fave bloggers (I do love all who read out in blog land!) If I tag you--- copy these questions and tag your favorite bloggers...to let the bloggers you've tagged know you tagged them, visit their blog and let them know. 1. Who is your style icon? My mother. 10. Greatest achievement? So far? Having a solo art show and selling more than one piece at it. Now...speaking of #1 on the list...today is the beautiful and talented Ms. JBM's birthday! To say I love this girl is an understatement. She is one of my best friends, my shopping, museum hopping and eating partner in crime. Happy Birthday JMo! 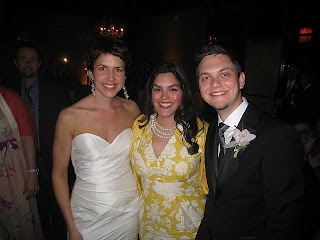 This weekend I was in Dallas with D to go to my dear friend Wim's wedding. The trip also let us visit with friends of mine from college, some of whom I had not seen since our wedding nearly 4 years ago. 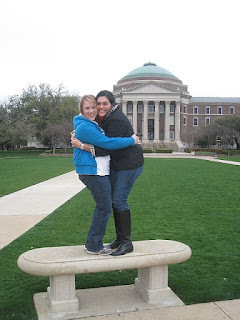 It was also my first time in Dallas in 4 years, which is crazy since I use to go once a year. It was such a great time seeing everyone, visiting campus, meeting new babies, and celebrating the first day of spring with snow fall! It was D's first time in snow, which was really fun to see. Friday we got to town later in the evening, but we went on a quick romp with my friend Kirsten to our home away from school, North Park Mall. After dinner, we grabbed cheese fries and burgers at Snuffers...oh yum! Kirsten then introduced us to my new favorite place in Dallas, Yogurtville. The place is pure genius...you pick a size...blend whatever flavors of frozen yogurt you want, pick whatever toppings you want, and pay by the weight! GENIUS! feed an army, we headed to my friend Avery's house. 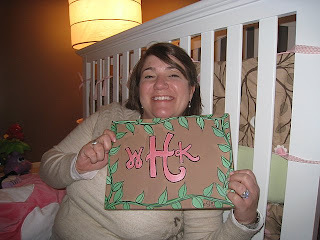 I wanted to see baby Wesleigh's room and give her the nursery painting I've had for them. I was so happy when all the colors matched perfectly! Ave and her husband John loved it...and Wesleigh crawled all around the room in excitement I'm sure. friend, one of the 3 musketeers, Lauren and her husband Paul were in town from Austin for the Black Eyed Peas concert, so they stopped by Ave's casa for a visit too. The 5 of us are part of a group of 6 friends who while at SMU in the Gamma Phi house, were all called, The Six Pack. We were missing J who is in DC, but it was the first time since my wedding this many of us have been together. It was so so special. by the Decemberists that he played for Brenda on the night they met. It was great...the best part of all (obviously apart from seeing so many friends at the wedding) was that it started to SNOW! First day of spring, and 5 inches of snow fell. It was beautiful. The next day we woke up to a beautiful blanket of snow, which was fun to play in. The day was short due to our flight but we did squeeze in lunch at Chip's before we headed to DFW. Our flight left out of the brand new Terminal D. Very nice. All in all albeit short, it was an incredible trip which I am so happy we took the time to go on. Congratulations to Wim and Brenda on their wedding, to the Hoenigs and Wards on their babies. For the first time in 9 years I am not pouring beer at John Martin's Irish Pub's St. Patrick's Day festival. It's the funnest place to be in Miami for this most festive day. Our friends all come out, you see the funniest ensembles, it's loads of fun! ...so why am I not there? I needed a break. 9 years I poured beer...and this year I kinda just wanted to to chill and not deal with drunk people that I am not friends with. I was in the spirit though, I wore all green today as you can see. I definitely did not get pinched! So, cheers and Happy St. Patrick's Day! I jokingly have been calling today, School Picture Day, because for the first time in nearly 10 years the entire museum staff had a group shot taken by a professional photographer. We also had departmental pictures, senior staff and individual head shots taken. ...so what do you wear on the day the day that your picture is going to be taken...the picture that needs to last at least 10 years? I went with something classic, yet colorful and fun. ...i.e. a lot of J.Crew with lots of pearls and fierce heels. Jelly Kelly to my big pink leather Kate Spade tote. I also started putting the final touches on our trip to Dallas this weekend...and continue to work on the two bags. Busy day! I also want to give a BIG BIG shout out to two talented bloggers who recently gave me a shout out. The great and talented Ms. Kristin Pearce who's blog I love to read everyday and to the lovely Stylestance Blog a chic and fun look at how to bring a daily dose of style into your life. So a special thanks to these two talented women. Take a look on their blogs, and read the fun they have to offer. It was a busy week. I kept working on two bags for a friend. ...but I don't want to show those off just yet. So...here is what I wore from Thursday - Today. Thursday I paired up an oldie but goodie skirt from Anthropologie with a great orange cardigan from J.Crew. I went with a long skirt again, because my knee is still bruised from curling last week...and I didn't feel like wearing pants. Friday was D's birthday--so the weekend became a birthday weekend. Friday, dinner at my in-laws with the whole immediate family. Saturday was great, the museum was having one of its famous boat tours to Stiltsville. I went and worked the tour (observations are a necessity) and got to bring D and two friends. After our literal 3 hour tour, we hit one of the greatest local places, Scotty's Landing. A great afternoon, only became a great night with a few friends coming over to help D celebrate. Happy 34! Today was Pi day (3.14), and what a better way to spend it than with women I love and respect at the annual Junior League of Miami, Women Who Make a Difference luncheon. It was so nice to be among friends...and it was especially nice to hear such nice things about this blog. I'm glad it's being enjoyed. I love writing it, I love sketching for it, I love showing off new work on it. I know it's been a while. My computer was on the outs...but now I'm back and I have a week of sketches to show off! It's finally warming up again in Miami. So yesterday I wore sandals...new ones that had been waiting for sunshine. Monday I had to wear tights because of my nasty curling bruised knee. Curling was loads of fun, but very hard...and will cause bruising! Saturday was a busy day. Hosting yet another baby shower for a fab friend in the afternoon and a fun curling lesson at night. The shower was such fun and we played Gift Bingo which made present opening sun and interactive. 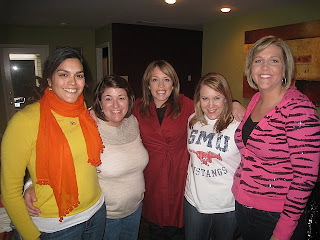 My lovely friend Melissa is due in May and was surrounded by 32 of her closest friends. ---Curling was hysterical fun...Teflon on the bottom of your foot is challenging! Trust me. I have the bruise to prove it....so does my friend Ashlee. Friday was so much fun! After half a day at work, we drove down to Islamorada in the Florida Keys for my friend Robin's wedding. It was gorgeous, and I LOVED my dress...too bad it was about 54 degrees! Anyhow we ate and danced the night away...and drank one of my favorite beers, Shiner Bock from Shiner, TX. Thursday was busy, after work D and I went to Miami Beach for the kick-off night of Dade Heritage Trust's Dade Heritage Days festival. Don't let the title fool you...Dade Heritage Days lasts nearly two months! Anyhow-- after that we stopped at Cassola's for my favorite pizza in the city. Tuesday was Texas Independence Day...which use to be such fun to celebrate when I lived in the Lone Star state. I even have friends who get the day off! Can you imagine? Saturday was a good time as we went to our friends Ben and Kate's wedding shower. Ben and Kate are much younger us than we are, having just graduated from UNC last spring. 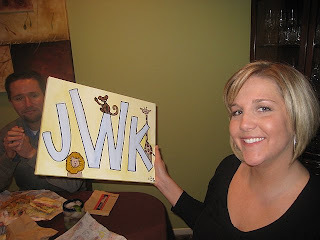 Actually I painted something for Ben, per a Kate commission last spring---you may remember. It was a nice night, and held at another friend's parents house, right across the golf course from us, so it was a nice stroll. 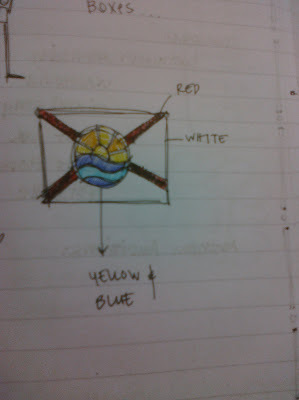 ...and finally the final sketch...from the last day of the Olympics. What a day! USA loss to Canada for Gold in Men's Hockey...then a rather interesting closing ceremonies. Anyhow---as you can see I've been busy. Tonight I started two custom bags that I want to have done by Sunday. I'll post pictures of those soon. 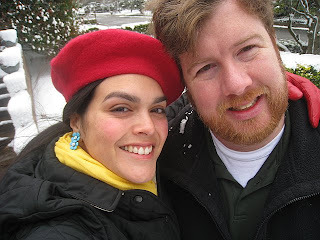 In the fall of 2008, my dear friend M worked at the Miami Art Museum. The education team across the plaza at MAM is smaller than ours is, and during an afternoon of comic conversation, they decided to form an Empire. Well, M brought the idea to me that we form an Empire as well, and that we have "cultural exchanges". Our education department quickly rolled with this comic challenge and came up with not only an empire, but titles for ourselves, a coat of arms and a flag! The Educational Empire of Historia. To the right you can see our flag, a little reminiscent of the Florida flag, and the ever present Obama logo, which as you can imagine was everywhere you looked in November 2008. M has since left MAM, but our empires still talk, and our coat of arms is still up on our chalkboard wall in the Educational Empire of Historia. ...by the way my title, Empress of Historia. I love museum folk and our culture! !